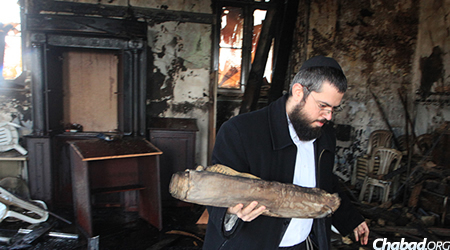 Rabbi Yitzchak Kofman, clearing away the ruins from the recent fire at the 500-year-old Great Choral Synagogue in Grodno, Belarus. It was late November 2013, and a children’s Chanukah program was scheduled to take place at the nearly 500-year-old Great Choral Synagogue in Grodno, Belarus. But the familiar holiday scene of children cheerfully eating latkes and spinning dreidels would not take place. 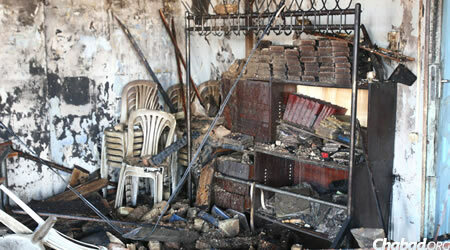 Instead, a fire broke out in the synagogue’s kitchen, gutting the rooms where the event was set to take place. The Jewish community of Grodno—destroyed by the Nazis, suppressed by the Soviets, yet still alive today—had been dealt another setback. Prior to the blaze, the imposing building’s facade had recently undergone a full restoration. The community has since launched www.fireingrodno.com, a website to help raise badly needed funds for the efforts ahead. Prior to the blaze, the imposing building’s facade had recently undergone a full restoration. Facing the charred reality of the synagogue’s current state, Kofman hopes to gain strength from the fire’s devastation and double down in his efforts for the area’s thousands of Jews. “I think we have an opportunity to rebuild in a much bigger way,” he says. Grodno’s Jewish past is a rich one, dating back to at least 1389, when Jews were initially allowed to settle there. But as with so much of Europe, along with their golden age the Jews of Grodno have seen extraordinarily difficult times there as well, suffering from expulsion, Cossack pogroms, European wars, revolution and, of course, the Holocaust. Built initially in 1578, the Great Synagogue was commissioned by the community’s famed leader, Rabbi Mordechai Yaffe, known widely as “the Levush” for his 10-volume codification of Jewish law, Levush Hamalchus. Designed by Italian architect Santi Gucci—the court artist of King Sigismund II Augustus of Poland—the synagogue was built of brick and survived until 1899, when it was heavily damaged by fire. The synagogue was rebuilt in 1907 in a mix of eclectic and Moorish styles, serving this important center of European Jewry until the Nazi surprise invasion of the Soviet Union in 1941. Before World War II, Grodno’s Jewish community numbered 25,000—half of the city’s overall population—and had scores of Jewish institutions and schools, such as Yavneh, Tarbut and Talmud Torah. 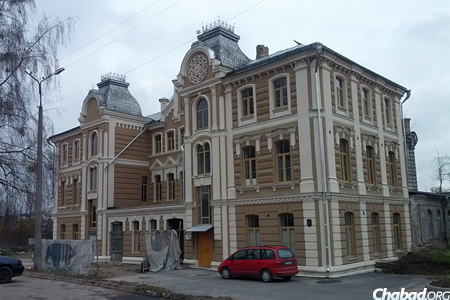 Until 1939, Grodno was also home to Yeshivas Shaar HaTorah, led by the renowned Talmudic genius Rabbi Shimon Shkop, who transformed the school into one of the most influential Lithuanian-style yeshivah in pre-war Europe. A successor school, Yeshivas Shaar HaTorah-Grodno, is today located in the Kew Gardens neighborhood of Queens, N.Y.
A third, newer Jewish cemetery, however, still exists. These days, Grodno sits some 15 miles from the modern Belorussian-Polish border. In the years following World War I, Grodno was a part of Poland and, as opposed to their brethren on the other side of the Iron Curtain in the Soviet Union, Jewish life flourished. When Poland was split between Nazi Germany and the USSR following the Molotov-Ribbentrop Non-Aggression Pact of 1939, Grodno found itself in Soviet hands. But it would not be for long. On June 22, 1941, the Germans surprised their erstwhile Communist allies by invading the Soviet Union. Facing the charred reality of the synagogue’s current state, Kofman hopes to gain strength from the fire’s devastation and double down in his efforts for the area’s thousands of Jews. In November of 1942, the Jews of Grodno were sealed into a ghetto surrounding the Great Synagogue. Deportations to German concentration camps began. By the end of World War II, Grodno, along with the rest of Belarus, was a part of the Soviet Union, and the Great Synagogue occupied by the regime. For the next 50 years, the synagogue would be out of Jewish hands, used alternatively for the storage of food and pharmaceuticals, and later, as a workplace for local artists. When the synagogue was finally returned with the fall of communism in 1991, it was heavily damaged, with no electricity or running water. To date, it remains the only part of the once-vast Jewish infrastructure of Grodno to be handed back to the Jewish community. Born in the United States and raised in Israel, Rabbi Yitzchok Kofman and his Israeli-born wife Nechama arrived in Grodno in 2003 to lead the revival of the city’s Jewish community. Living in faraway Belarus, the Kofmans’ six children attend school via the Brooklyn-based Shluchim Office’s Online School for Chabad emissaries living in places with no available Jewish education. Since their arrival, the couple has opened a Jewish preschool and kindergarten—in a location separate from the synagogue—but have always hoped to rebuild the ancient synagogue to serve as the all-purpose Jewish community center it once was. With the help of the Rohr Family Foundation and private donors, the massive, dilapidated synagogue was partially renovated, with rooms being made usable for a synagogue and community center. Yet the great sanctuary—with its soaring, vaulted ceiling and detailed moldings—has remained unheated and in need of significant repair. When fire struck this past Chanukah, the progress that has been made until now took a big step backwards, spelling difficulty for the Jews of Grodno.